Well that didn’t go well. After months of managing Masters speculation through green tinted glasses, Ireland’s hopes of donning a first green jacket come Sunday took an almighty hit on day one at Augusta National. As far as car crashes go, it was a slow burner for Rory McIlroy while Shane Lowry reversed out of his driveway and straight into a tree. It’s amazing what the game of golf can do to a man’s psyche but the aura of Augusta’s potpourri pines coupled with its penal playing fields seem to magnify fragile thoughts and ensure there’s no place to hide until your ball disappears on the 18th green. For Lowry, it was hard not to feel that we’ve been here before when he bravely faced the media post-round despite it being the last place he would have wished to be. After months of painstaking graft to secure his Masters invite, it was hoped that the Clara man would play with a freedom that such a noose around his neck prohibited in recent weeks. Instead he confessed that he wanted to play well so badly that his mind became awash with regret as shots trickled away at every turn. “Everyone talks about the Masters and everybody was,” said Lowry. “It almost gets annoying when you are on the border of getting in and people are annoying you about it. Then you come here and shoot 78 in the first round and you think, what’s the point of being here? We all admire Lowry for wearing his heart on his sleeve but the six-inch battle has been one he’s been losing for some time now. This latest revelation that he’s been annoyed about the external pressure being placed upon him by routine media questioning is a worry because it simply shouldn’t affect a top athlete as it seems to concern Lowry. It doesn’t take a sports psychologist to identify a blindingly obvious issue with staying in the moment for the 32-year old and if Lowry’s to break bread at golf’s top table once more, it will be a frailty he must first accept, then eradicate in order to post the numbers his talent demands. Perhaps he could converse with the mindful McIlroy and share notes over green tea and juggling lessons, or maybe Rory will be just as agitated after watching Bryson DeChambeau and Brooks Koepka launch themselves to the front after day one six-under par 66s. I was relatively calm when McIlroy came off the golf course last night. Despite those two agitating bogeys on 17 and 18, he played poorly most of the day and if he had parred in, a one-under par return considering his play would have been a real coup given the field looked to be bunched around minus-three. Now, however, McIlroy’s already faced with a seven-shot deficit in his quest for Grand Slam glory and with Phil, DJ, Adam Scott, Jon Rahm and Tiger all ahead of him, the pressure has just increased ten-fold on getting it done this year. 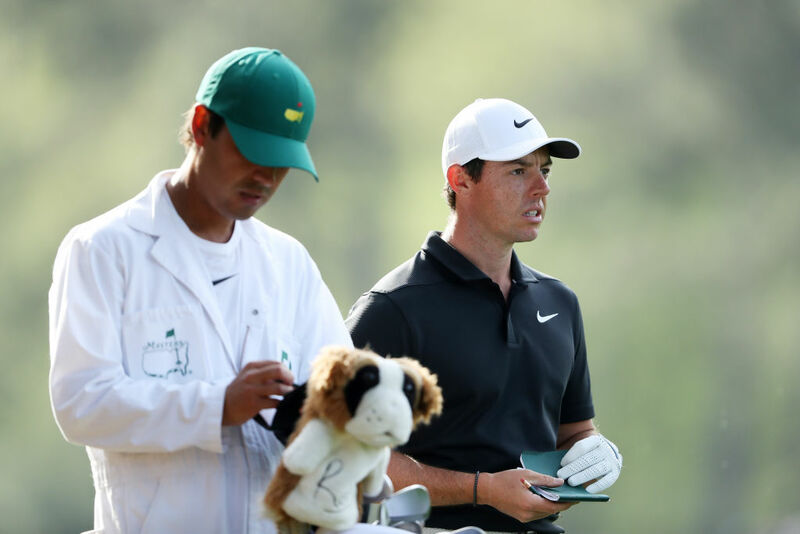 At times yesterday, McIlroy looked like he was playing foursomes while the rest of the field enjoyed taking advantage of the unusually soft, target golf like conditions that Augusta was presenting in its traditional singles strokeplay format. The 29-year old looked mercurial at times, his blind-sided approach shot through the gap in the trees on 15 to set up an eagle try was special. But too often the other McIlroy was handed a turn; his putting stroke tentative, his chipping often clumsy. Even his driver was giving it the two-way miss, McIlroy opening his round with a high push right and finishing it with a snap hook left. What a difference a day makes, 24 little hours… By that same sentiment, not all hope is lost just yet.